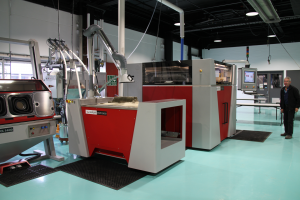 The Commonwealth Scientific and Industrial Research Organisation (CSIRO) has opened a new innovation centre that will accelerate industry adoption of metal 3D printing and other emerging additive manufacturing technologies. According to the news release by the CSIRO, the $6 million centre – called Lab 22 – will provide Australian companies with affordable access to specialist additive manufacturing equipment and expertise which offer huge efficiency and productivity benefits for product development. “This advanced equipment is in the range of $1 million per unit, but the vast majority of small and medium-sized businesses (SMEs) don’t have that amount of capital on-hand to take a leap of faith on a new or emerging technology,” said CSIRO additive manufacturing research leader, Alex Kingsbury. She said Lab 22 will remove one of the major obstacles facing small businesses in adopting 3D printing with metal by lowering their capital investment risk and allowing them to “try before they buy”. She said Australian 3D printing service companies, Made for Me and Keech3D, were the first companies to sign to use Lab 22’s new space, with several other companies already expressing interest to join in and grow their metal 3D printing services. According to the CSIRO, Lab 22’s additive manufacturing equipment includes: Arcam A1, Concept Laser M2, Optomec LENS MR-7, Voxelject VX1000 and Cold Spray Plasma Giken. Cold spray deposition technology, laser heat treatment, surface engineering and advanced machinery are also available to improve efficiencies, performance and profitability. “CSIRO has partnered with industry on a range of world-firsts using its Arcam 3D printer, including a titanium heel bone implant to treat a cancer patient, a mouthguard for treating sleep apnoea and a customisable ‘orthotic’ for horses suffering laminitis,” reads the news release.